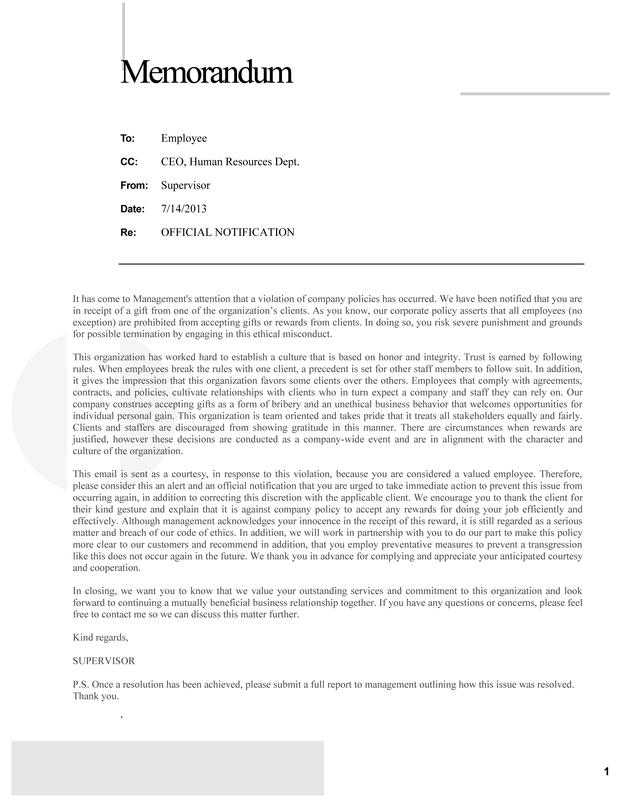 By composing this letter, the supervisor is immediately taking responsibility of the seriousness of the matter and addresses the situation with recommendations to the employee for a swift resolution. The leader analyzes the issue, acknowledges the situation intensity, and identifies the matter as unethical behavior. By addressing these components, it is easier to decide on the appropriate action required to reach a mutually beneficial and ethical solution. These actions portray a skilled leader whose direct approach is sharp and swift while remaining sensitive to a valued employee’s unmitigated circumstances. There is nothing wrong with employees or clients showing appreciation for outstanding performances. However, this situation dictates that employees and clients follow the parameters of company policies to avoid situations where a staff member may lose their job by inadvertently participating in ethical misconduct by innocently receiving a reward. Boatright (2009) reminds us that justice requires that everyone has the right of equal opportunity to succeed in life (Boatright, 2009). However, receiving favors and rewards from certain clients is not fair to other employees who work just as hard and are not acknowledged for their excellent performances. Policies can change over time, however in order to do so, it must be done on a corporate wide level and implemented into the company’s culture and code of ethics throughout the organization so that employees have clearly defined parameters of what is right and wrong behavior. In conclusion, arming employees with strong reasoning abilities and intellectual skills can help them better comprehend ethical challenges and find more effective solutions to complex issues that are in alignment with corporate procedures and policies.